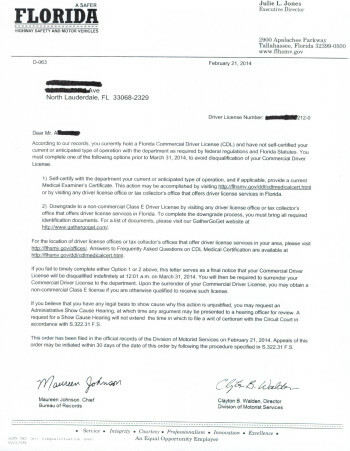 Did you get a CDL Medical Certification Expiration Notice from the Florida DHSMV in the mail? This letter from the Florida DMV must be taken very seriously! If you do not get your DOT Physical, then your commercial driver’s license will be suspended. Call us for an immediate appointment. We take care of the rest for you! Yes, you can get a citation for driving your own vehicle with a suspended/disqualified CDL. 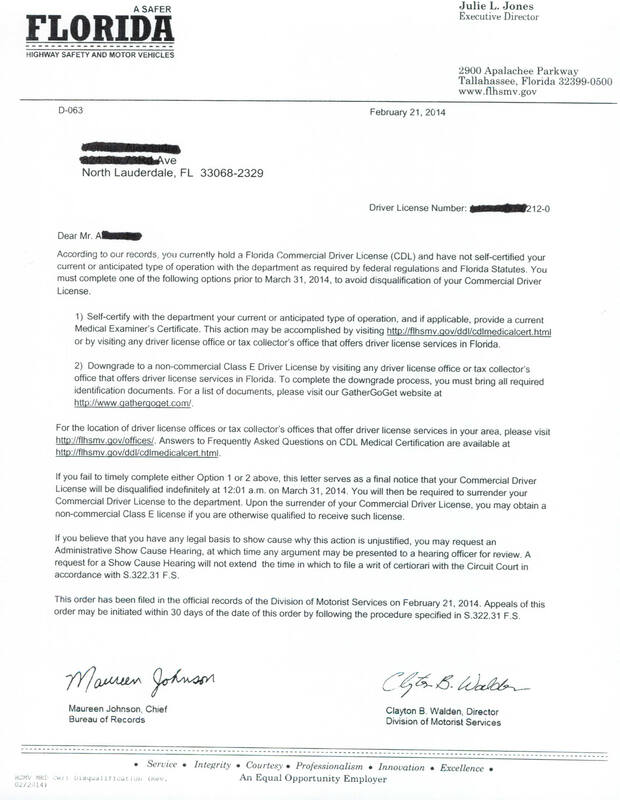 The Florida DHSMV automatically generates a letter when a CDL Medical Examiner’s Certificate expires. The letter says Commercial Drivers will have their CDL privileges suspended if they do not update their Medical Certification or surrender their CDL for a Class E license. You may or may not receive this letter. Whether you receive the letter or not, the state will suspend your CDL if you do not have an updated medical examination. Many drivers in Florida have been issued citations for driving while their CDL is disqualified which has resulted in mandatory court appearances and fines of up to $250.00. I received the Medical Certification Expiration Notice after I have already updated my DOT Physical Medical Card. What do I need to do? If you receive the letter from the DMV after we issued your DOT Medical Certificate, then you may disregard that letter. You are should have your CDL Medical Exam 45-60 days prior to expiration. Either way, disregard that letter. What happens if I do not update my DOT Card/Medical Examiner’s Certificate before the date in the letter? If you want to retain your CDL you will be required to pay a reinstatement fee. Frequently Asked Questions FAQs for CDL Physicals are answered for your convenience CLICK HERE. We are your ONE STOP Fort Lauderdale and Broward DOT Physical exam location for your Commercial Driver’s License! We perform DOT CDL physicals, and then we issue your DOT CDL medical examination card with same day license updates! DOT requires you have an updated DOT Physical CDL Medical examination to be compliant with DOT regulations. Walk-ins are available or you can call our office to set an appointment. Don’t let your CDL expire. If your CDL expire, then the consequences may be costly! Call 954-797-1490 for your NO WAITING appointment or walk in for your CDL Physical and we will assist you through the Florida CDL Self-Certification process. When you have your Ft Lauderdale DOT physical with us we ensure you know all updated information on the recent FMCSA DOT physical changes that affect you. Our drivers consistently return, refer their DOT physical driver friends and co-workers and have always said it is the best DOT physical they have ever had. Service: a principle that is OUR commitment to you – See what you should have been getting all along. We set the standard for DOT Physical excellence and look forward to serving your Ft Lauderdale DOT physical and DOT CDL Medical Exam needs now and in the years to come.